The Specialized Secteur 2013 Review by Enjoy Cycling has been both exciting and enjoyable. The Specialized Secteur is another great bike from the well known American brand that will not disappoint. With the growing popularity of cycling in the UK many people are taking the first steps in to the world of road cycling and choosing a bike can be a dilemma. There are many road bikes on the market offering many different specifications. For many the cycling position on a traditional road bike may be uncomfortable with the head down bottom up position not suiting everyone and this is where the Specialized Secteur comes in to play. Specialized Secteur 2013 Review by Enjoy Cycling. I put this quality machine through its paces on the streets of Manchester and I am impressed, a comfortable and stable ride. A bike to be considered when choosing a road bike. It is marketed as an endurance road bike and my Specialized Secteur review has found out why and I have to say I agree. I have ridden many bikes in my time and I like the 2013 version of the Secteur. It offers a more relaxed seating position compared to its sibling the Specialized Allez which is an entry level pure race bike. Due to the unique geometry of the Secteur the rider has a more upright position and I have found it is more comfortable for longer rides and for those looking for a road bike to enjoy. I was lucky enough to get my hands one and here is my Enjoy Cycling Specialized Secteur 2013 Review. The bike comes in a striking red and black paint job that looks the part. Its unique frame shape with curved crossbar certainly makes this bike stand out. I have not seen any of these on the roads of Manchester and I have to wonder why. It is a stunning machine that is no ugly duckling and is a pleasure to ride. The frame is made of aluminium so it is light weight, it also comes with carbon forks as standard which adds to the comfortable ride taking the sting out of the bumpy Manchester roads. The unique frame contours offer the rider a more upright seating position but it does not take anything away from what is a quality road bike. It may be branded as an endurance road bike but during my Specialized Secteur 2013 review I covered over 60 mile on a group ride and the bike held its own with more expensive pure race bikes. The Specialized Secteur is very similar to the Allez in many ways but it offers a little more in some areas. The frame is made from lightweight aluminium with the added bonus of a carbon fibre fork. The frame is an unusual shape that gives it distinctive looks and a sleek appearance. The frame is designed to offer comfort and stability on long rides. The lightweight carbon forks make for a comfortable ride and offer precise smooth steering control at high speed. I have ridden the bike for a week and the bike has to be one of the most comfortable road bikes I have tested. The wheels have been upgraded for the 2013 model to Axis Classic which are hard wearing and solid wheels. They are by no means light but guess these can be upgraded when needed. The tyres wire beaded Specialized Espoir Sport with double blackbelt protection meaning they are puncture resistant and ideal for commuters. There is nothing worse than getting a puncture while on a long ride or your morning commute so the extra protection is always welcome. 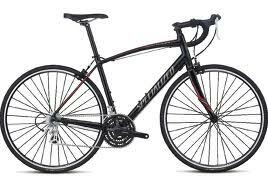 The Specialized Sectuer 2013 comes complete with Shimano 2300 STI shifters which are the base models in the Shimano range. I have found these gears to be sharp and easy to use. It has a triple chain ring so it can tackle any climb. 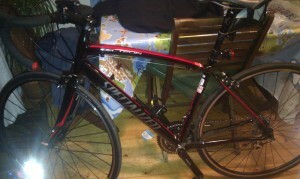 I have always been a fan of the Specialized Allez but I now have another favorite. After a week riding the Specialized Secteur I have thoroughly enjoyed it and I would recommend it to anyone who is looking for first road bike. The comfortable seating position combined with its looks make it a very good road bike. Some people will see this as a pure race bike and they may be right but it did not stop me keeping up bikes far more expensive than this.